Snow wreaks havoc on my life. 1. I drove to the rec center. The lot hadn’t been plowed, and so the lines in the parking lot weren’t visible. The result? Eight cars parked tightly into the space allocated for four cars with handicapped parking permits. 2. I went to lunch. Before parking, I circled the block to assess how well plowed the street, curb cut and sidewalk were. I decided to risk it. I parked in a permit space, got out of my car, and almost got stuck in the slush/snow that had collected in the curb cut. When I left the restaurant, I found that someone had parked right next to my car in the cross-hatched access aisle. I went back into the restaurant, found the owner of the red Outback, and walked out with him. “There’s no sign,” he said. “There are stripes on the pavement,” I pointed out. 3. I tried to go to choir rehearsal. The church parking lot hadn’t been plowed, either, and all two of the parking spots that were immediately adjacent to the curb cut were taken. If there hadn’t been snow, I would have parked somewhere far, far away where no one was likely to park me in, and then gone all the way through the parking lot to get to a curb cut. With snow? Impossible. I drove back home. Laurie, truer words were never spoken. 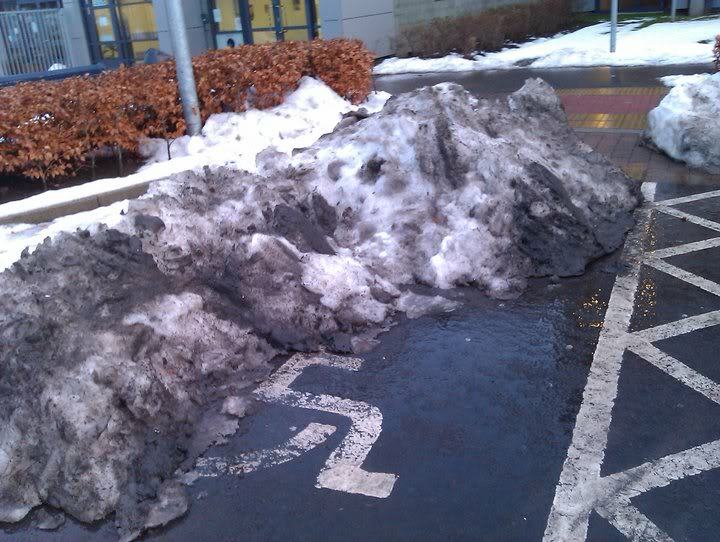 I too have found in parking spots where handicapped parking spots have not berb plowed. It’s as if we have forgotten people–not important.